With Shormann Math, using 21st Century technology to create a math course allows us to obtain valuable information revealing that, regardless of skill level, students who want to learn math, can, and Shormann Math has the tools for them to do so. For example, during quarterly exam week, students are provided with two full-length practice exams. Practice exams allow students to prove to themselves that they really do (or don’t) know the material covered that quarter. Besides the practice exams, they are given other guidelines on how to prepare for the exams. The guidelines are based on years of teaching experience, as well as observing university professors. Between my bachelor’s in aerospace engineering, and a PhD in aquatic science, I had a lot of professors and exams! And the best professors, the ones who really wanted you to learn the material, did two things: 1) they kept a file of previous exams in the library that students could check out and study, and 2) they had office hours so students could ask questions. Shormann Math provides both, with 1) practice exams that reward students for a good study effort and 2) free email Q&A any time. But are the practice exams helpful? Well, see for yourself. The following graph displays the recent results of Quarterly Exam 1 scores for Shormann Algebra 1 and 2(beta) students. * The bottom line is that students with “Good” study habits made A’s on the exam. The graph is a display of the obvious fact that good study habits build fluency, resulting in good scores on the actual exam. Being fluent in math means you know how to use the rules to solve new problems. And the purpose of the Practice Exams in Shormann Math is to provide new problems so the student can prove to themselves whether they are fluent, and if not, what they need to review. At some point in your life, you will be tested on a large amount of information. Whether it’s for a job you really want, a driver’s license, an SAT, ACT, MCAT, etc., sooner or later, test day is coming. And if you really want that license, or that job, etc., you are going to put the personal effort into it to study. Shormann Math is designed to help students build effective study habits in a less important setting where the stakes aren’t as high. But, as the results above reveal, the best curriculum in the world won’t make a bit of difference if the student doesn’t put that personal effort into following directions and studying effectively. *Graph details: Scores are from Quarterly Exam 1 taken by students in Dr. Shormann’s live online Algebra 1 and 2 classes, October 2015. The three categories are based on student performance on the 2 practice exams take prior to the actual exam. The students are allowed to take the practice exam, review mistakes using the solutions manual provided, and then take it again. Students who put the effort into retaking each practice exam were rewarded for their effort with a higher grade. Students are also encouraged to show work on their paper, solving each problem by hand. For the actual exam, they are required to submit handwritten work on each problem. The practice exams were counted as one of their homework grades, providing further encouragement to complete them. The three categories were broken down as follows: “Good” students averaged 95% or better on the practice exams, all of which took at least one of the exams more than once in order to get a higher score, which means they took the time to correct their mistakes and study the problems they missed. “Mediocre” students took each exam once, but averaged below 95%, and showed little to no effort to try the exam again, missing a valuable opportunity to review and build fluency. “Poor” students did not attempt either practice exam. Of special note is the fact that the trend was consistent, regardless of which course students were doing (Algebra 1 or 2). Also, because the students had the opportunity to retake each practice exam until they received a 100, study effort, and not skill level, was the main factor influencing performance on the actual exam. Not all students are equally gifted in math (or any subject), but students who are less-skilled at math can do better by studying harder. 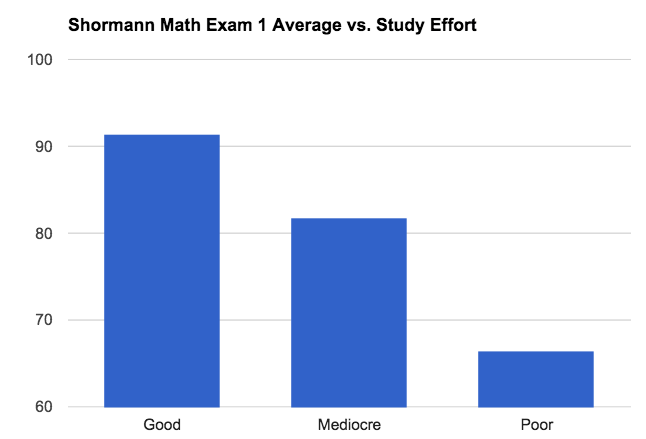 These results provide good evidence that, with Shormann Math, students who want to learn math, can, regardless of skill level!